EOS Goddess of the Dawn is dedicated with admiration and gratitude to Thierry Fischer and each member of the Utah Symphony. Their world premiere performances, captured here on this CD, illustrate their exceptional, colorful, accurate, nuanced and passionate playing for which I express immense appreciation. EOS is in honor of Pierre Boulez, who premiered three of my works: WORDS OF THE SEA for orchestra, CONCERTO FOR ORCHESTRA “Orbital Beacons” and IN MY SKY AT TWILIGHT for soprano and chamber orchestra. Mr. Boulez recorded, toured, and supported my music over many years and I was so happy to be able to send him the score, program book, and premiere performance recording of EOS in mid 2015. Greek mythology and dance are two of my lifelong passions. My other works on Greek themes include SELENE for percussion quartet and string quartet; HELIOS CHOROS for large orchestra; TERPSICHORE’S DREAM for chamber orchestra; and EUTERPE’S CAPRICE for solo flute. My catalogue includes 45 additional works for orchestra or orchestral concerti and I conceived most of my orchestral and chamber works as suitable for dance. I stand at the drafting table as I compose and fully embody the sounds by dancing (though, trust me, you do NOT want to see me dance! ), scatting the music, singing the music, playing it at the piano, and feeling the flow, impulse, inner life of the line, whether that be slow and timeless or jazzy and driving or capricious and fleet footed. When an orchestra member asks me a question, I usually sing the answer. Although my music is careful and precise in its notation and structure, I like my music to have the feeling that it is an organic creation being self-propelled on the spot as if we listeners are overhearing an improvisation. I try to imbue the music with my own physical and mental sense of caprice, an improvisatory spirit, and a joy in a diversity of characters and colors. EOS exhibits a kaleidoscopic variety of rhythmic syntaxes, radiant colors, and resonant harmonic fields. I work hard to present a very clean and thoughtful technical control of materials and orchestration. I hope my efforts result in unique compositions -- always luminous and never muddy. I am honored to be part of this spectacular project with the Utah Symphony and thrilled to share EOS with you. — Eos opening the gates of heaven for the sun to rise. — Early morning birds in nature's muse. — Eos' team of horses pull her chariot across the sky (which are named in the Odyssey as Daybright and Firebright). — Eos welcomes Aura (Titaness of the breeze and the fresh, cool air of early morning). — Eos summonses Hypnos (God of Sleep) and Mnemosyne (Titaness of memory and remembrance, and mother of the Nine Muses) to release all those who are asleep and dreaming so that they may wake. — Eos applauds her brother Helios (personification of the sun) as he drives his chariot of horses across the sky. — Eos greets Aether (the god of the upper atmosphere and light). — Eos thanks her mother Theia (Titaness of sight and the shining light of the clear blue sky) and her father Hyperion (Titan of light) who are also the parents Eos' siblings: Helios (sun) and Selene (moon). Libby Hanssen, KC STUDIO, Kansas City, March 29, 2019 "The experience of EOS is what live performances are for, with a rich interplay of the voices and the shimmering, combative harmonies. ...there were some impressive individual moments, especially from the winds, like the bass clarinet and bassoon during “V: Spring Rain” and the formidable percussion part." Augusta Read Thomas is one of the most accomplished composers of the American mid-career group. She has been prodigiously prolific for the past thirty years or so of her professional life, including many works for orchestra. In this regard, she was the Mead Composer-in-Residence with the Chicago Symphony Orchestra from 1997-2006, and during her tenure wrote nine commissioned works. Her music is light and effervescent, expressing a panoply of intricate shadings. Even at its most rhythmic, the music is always supple and probing. Her music engages and continues the tradition, as it is an extension of the French/Russian world of Debussy and Stravinsky and her primary teacher Jacob Druckman. All of her strengths are displayed in a new release by the Utah Symphony that includes her work EOS (Goddess of the Dawn), a Ballet for Orchestra, which is in seven movements all written and played without break. Titles are evocative, starting with Dawn and then tracking the day. Dawn enters with a slow sustained note very much like Lontano of Ligeti. The crescendo is less long, finally bringing in gesturally rich flute figures. Gestural here means the figure is quasi-improvisatory and thus its rhythms are fluid, sounding out of metered time. And as befits the time of day, instruments gradually appear as the world awakens, and the course of the movement is that of getting most of the orchestra playing and finally hitting some repeated 8th note motion as the day gets to chugging along. This movement segues into Daybright and Firebright, which is more episodic. It throws a single line around the orchestra with punctuations in a bravura-like manner with occasional pauses to catch its breath. The third movement, Shimmering, does just that with lots of sustained high notes and tinkling percussion. Dreams is like the beginning, with languid materials in the flute and clarinet but now accompanied by a harp playing rising arpeggios. A slow, almost ponderous cello line breaks in and continues to the end of the movement paired with gossamer long-tones in the winds. Spring Rain is dappled and splotched, and is formed of quickly changing stabs of color. The rhythm, like rain, is episodic, as it rushes forward then hesitates or stops. Golden Chariot takes over, and it is even more hectic and rambunctious, but very much a continuation of the previous, with the rhythm frenetic and of one layer. Sunlight concludes with bright long tones that are occasionally quickly reiterated, and ends in a tonal, lustrous, and fiery blaze. Thomas’s music is, above all, colorful. Her bright dazzling colors transform over time, so that we are drawn into their metamorphosis. Harmonic fields are at play that seem vaguely tonal and frequently emphasize unisons and perfect intervals, the major third, and the major seventh. In an impressionistic way, fast and scintillating solo winds are often accompanied by slow moving strings. The tessitura favors the higher ranges, keeping most of the music light and fleet. The orchestration features high percussion instruments—glockenspiel, crotales, vibraphones, and the like—adding to the high glistening and polished quality of sound. The larger structure is simple, clear, and elegant. Individual movements vary widely in duration, which creates a delightful sense of playfulness with music’s primordial medium—time. This is music that is always in motion, as if coming perpetually out of a magician’s hat. It leads but doesn’t direct, and is playful and subtle, dancing on light feet. It is music that conjures. The work is played beautifully and powerfully by the Utah Symphony and its music director Thierry Fischer, who commissioned the work. This is a fine and mature composition with which to begin to get to know this superb composer, and I suggest you pick it up pronto as it is not to be missed. "Also engaging to ear and mind is Thomas' 2015 orchestral ballet "EOS (Goddess of the Dawn)", one of the prolific Chicago composer's most luminous scores. The eight short sections call to mind mythic, celestial images — dawn breaking, chariots racing across the heavens and so forth. The music eases into delicate dream states when it isn't dancing in exuberant, asymmetric patterns." "Augusta Read Thomas has secured for herself a permanent place in the pantheon of American composers of the 20th and 21st centuries. She is without question one of the best and most important composers that this country has today. Her music has substance and depth and a sense of purpose. She has a lot to say and she knows how to say it — and say it in a way that is intelligent yet appealing and sophisticated yet extremely accessible. "She is known for her carefully crafted scores and colorful orchestrations. Thomas is adept at bringing out the very best in each instrument and each section. She also knows how to combine instruments to create stunning sounds; she plays with overtones and she shapes notes and phrases by finely tuned dynamics and accents. "All of this is present in EOS: Goddess of the Dawn, a Utah Symphony commission which the orchestra and Thierry Fischer premiered this weekend (Thursday in Ogden, yesterday in Abravanel Hall), and which is also being recorded for future release. Scored for large orchestra with an expansive percussion section, EOS, which is dedicated to Fischer and the Utah Symphony, is a vibrant work, vivid in its painting of the sunrise and gorgeous in its overall imagery. It demands the utmost in precision to be effective and the orchestra delivered, giving a crisply articulated account. The many small and larger solo moments were also played with finely inflected lyricism. And throughout the approximately 17-minute piece the musicians, singly and as an ensemble, played with self assurance and virtuosity. "Fischer was fully invested in the work; his direction was well conceived and executed and underscored the intense drive and the almost restless energy that courses through the work, even in the slower, more reflective, middle section. He brought cohesion and seamless flow to his reading." "EOS, at just over a quarter of an hour, creates vast vistas of orchestral colors, harmonies, and textures, precisely observed. Melodies are heard only in fragments, but who needs them when a composition is so well-constructed and spirited in its own domain. "Eos is a Titaness and goddess in Greek mythology. 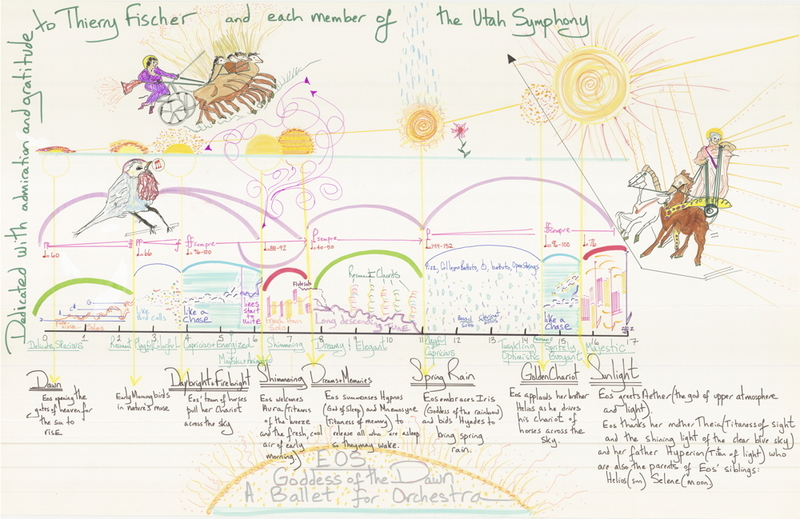 The six sections of the composition are subtitled Dawn, Daybright and Firebright, Shimmering, Dreams and Memories, Spring Rain, Golden Chariot, and Sunlight. Dawn, Shimmering, and especially Spring Rain (where Eos embraces Iris and bids the Hyades to bring spring rain) were the most compelling, but all attained a high level of craft in orchestration, and merged into each other with emotional honesty. EOS captures the pictorial scenes and conveys the many moods of this Titaness and goddess as she sails across the heavens and interacts with her inner circle. The effervescent orchestration and piquant harmonies were captivating. Each of the seven sections in EOS is more or less designed to be a tableau, as if in a ballet. Indeed, before the performance, Augusta said she could envisage the dancing and lighting for each one. 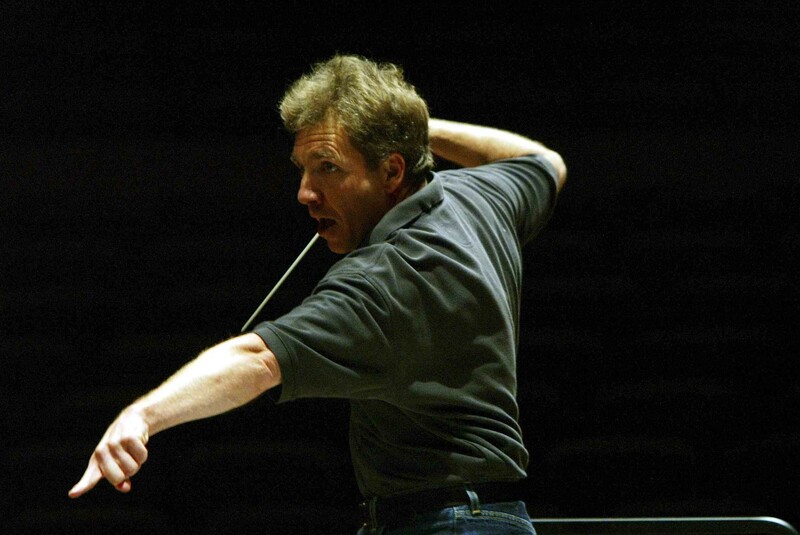 "Augusta Read Thomas, born in 1964, was a savvy choice for the commission of a new work by the Utah Symphony. She is American, but venerable French composer and conductor Pierre Boulez championed her compositions when she was resident composer at the Chicago Symphony Orchestra from 1997-2006. Daniel Barenboim, music director of the Chicago Symphony from 1991-2006, also conducted some of her compositions. EOS was composed in honor of Pierre Boulez, and is "Dedicated with admiration and gratitude to Thierry Fischer and each member of the Utah Symphony."" Alan G. Artner, Chicago Tribune, March 1, 2016 "The bright, bouncily rhythmic sounds of "EOS" made for aural glitter. "EOS" is a colorfully orchestrated diversion for large forces that....tickle, cheer and please in skeins." Marcus Karl Maroney, ConcertoNet.com - The Classical Music Network, April 7, 2016 "Debussy’s Jeux may spring to mind, but the sparse transparency of Thomas’ palette in EOS edges closer to a metallic Copland. Resonant percussion enhances a mostly heterophonic score evoking various facets of Greek mythology. Thomas fulfills her goal to create a score that is “always luminous,” and the clarity of her vision presents the orchestra in full exposure, with nowhere to hide. 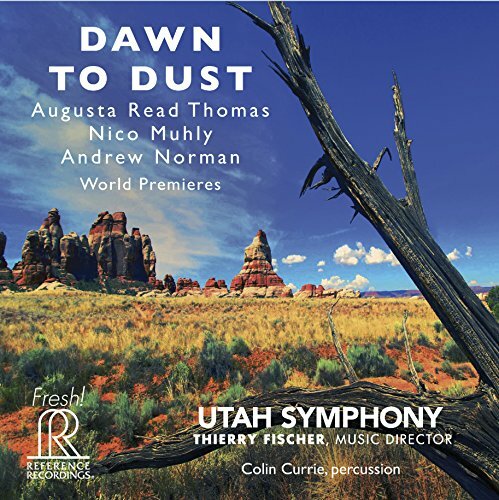 The depth of the Utah Symphony’s talents, vigorously organized by Thierry Fischer, are on fine display through the work…(and) the timbres of Thomas’ work clearly evoke a world of ethereal mythology." Jason Victor Serinus, Stereophile Magazine, April 9, 2016 Grammy-winning Read Thomas, whose Eos celebrates the Goddesses and nymphs of Greek mythology, is content to let the yin side of her personality emerge as her creation dances through your listening room. The opening of the ballet is luminous, the sounds of darting rain wonderfully effective, and the kinetic effects most gratifying. Eos...will surely find a home in the hearts of listeners who prefer to dream without being awakened with a bang. Prediction: The visionary new music, system-testing percussion, and virtual rainbow of colors that distinguish Dust to Dawn, the latest hybrid SACD in Reference Recordings' Fresh! series, guarantee that it will become a hit among music-loving audiophiles who dare play tracks beyond 3 minutes in length. The inventive genius that courses through the recording's three compositions—Control (Five Landscapes for Orchestra) by Nico Muhly, 34; Switch by Andrew Norman, 37; and Eos (Goddess of the Dawn), a ballet for orchestra by Augusta Read Thomas, 52—is, in and of itself, enrapturing, formidable, and breathtaking. But when combined with the spectacular coloristic and percussive effects captured by the Soundmirror engineering team, you have a recording virtually certain to earn Dust to Dawn at least one Grammy nomination and countless airings at audio demos. Edward Reichel, Salt Lake City Magazine, April 20, 2016 But the real gem of this disc is Augusta Read Thomas’ EOS. Thomas understands the instruments of the orchestra like few of today’s composers do. EOS is an excellent example of her orchestration talents; it’s brilliantly written and each instrument and section is seamlessly integrated into the textural and musical fabric. The score is vibrant, dynamic and rhythmically thrilling. It’s a well conceived and executed work that probes and explores the thematic material fully. It has depth, substance and is filled with real emotion. Graham Williams, HR Audio, April 1, 2016 The programme opens with 'EOS (Goddess of the Dawn)' by Augusta Read Thomas (b.1964) whose command of a wide ranging orchestral palette is breathtaking. She subtitles the piece 'A ballet for orchestra' and confesses in the liner notes that many of her orchestral and chamber compositions were conceived with dance in mind. Lasting around 18 minutes and played without a break, 'Eos' has seven movements each of which has a descriptive title. These, and a ballet narrative, are also reproduced in the liner notes and I found them most helpful in following the progress of the work. The music is full of ravishing orchestral sonorities, the subtle use of glittering percussion and writing for winds being immediately striking, whilst the almost Mahlerian string passages in the fourth section 'Dreams and Memories' are equally memorable. Textures have a crystalline clarity throughout and the ever changing variety of rhythmic patterns holds the listener's attention in a composition of great eloquence and lucidity. Jonathan Blumhofer, ArtsFuse, April 20, 2016 Better is EOS, Thomas’ seven-movement “ballet for orchestra.” This is a score that’s packed with color and energy and scored with breathtaking precision: no gesture or sonority is wasted, from the delicate, opening evocation of the dawn through to the closing blaze of sunlight. Its narrative is neatly distilled and that, in turn, has brought out writing from Thomas of great focus and personality (listen to the Stravinsky-infused “Spring Rain” for some of her most charming music to date). Geoffrey Larson, Second Inversion, April 25, 2016 Thomas’ EOS is subtitled Goddess of the Dawn, a Ballet for Orchestra, and presents a tableau of Greek gods and goddesses. It’s interesting to note her remarks in the liner notes, where she mentions her compositional process involves standing at a drafting table to connect with the feel of dance. We are soon taken on a playful journey that is a true concerto for orchestra. 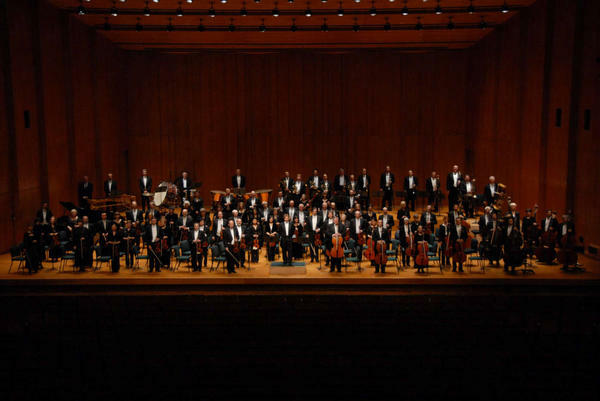 Utah Symphony really wows in Augusta’s music: the way challenging runs pass through the entire orchestra with perfect precision and ensemble is truly something for the ears to behold, and the Soundmirror recording team has produced a wonderfully balanced and transparent capture of the performance for Reference Recordings. To purchase a map of EOS, please visit the Online Store.